The Shee's lost knowledge: Understanding in game stores (Doctor's page and Aprodisiacs). aka "Health" and "Aphro" files. The data for both those stores is kept in the "Health" and "Aphro" files, in the game main directory. Note that the "HealthBU" and "AphroBU" files are clean backups of those. Whenever you use the backup kit to restore their contents, the files are deleted, and replaced by the "BU" files. Thanks to our previous knowledge of various file formats, and especially raw image files, understanding those is now a breeze. At this point I will spare you the very details of the process as you should've become pretty familiar with reversing file formats if you've read my other articles on the topic. Manipulate fields to see how they impact the file, and the other way round. ... and the end of the first record. The contents of the "Aphro" file are of the same format. 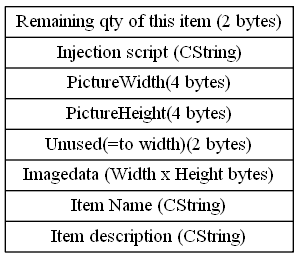 The following schemes sum up the file format. And Picture data is the raw data of the corresponding sprite. Note that this gives us the opportunity to use pictures for the kit that are different from the actual in-game item. Now we understand how those stores work, let's confirm we can indeed produce valid files. 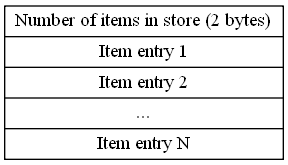 To add an item, we simply need to modify file header to count 1 more item than what it was previously, and craft a valid item entry to be appended at the end of the file. Let's keep things simple and just mimic the injection of a honey jar. We can copy most of required information already made for us from a Honey Jars.cob file for a standard honey pot ( injection script, image data...). If you ever mess the file too badly, chances are the kit will restore it automatically for you. Otherwise, you can just recover it from the "HealthBU" file. So what can we do with today's learned information? Parse the Health and Aphro files to display similar content in our own third party kit.